Fifty MBU and a dozen MPV volunteer recruits attended their first class on Feb 13. See story. Every year around this time I am reminded of the unique opportunities available to us in the Santa Monica Mountains National Recreation Area and surrounding open spaces. The recent rains have created a beautiful green blanket on our mountains, and the weather, despite the rain, is possibly the best of the year. Meanwhile, many people across the US are still buried under several feet of snow and can only dream of riding off-road in March. This is also the time when many of us start thinking about getting back on the bike after not riding for a while due to the holidays or other commitments. Keep in mind that the rains have created new trail conditions, such as rain ruts, land slides, and increased foliage growth. And of course the Station Fire, which decimated a large portion of acreage in the Angeles National Forest, has caused several road and trail closures. It is your responsibility to find out the conditions of roads and trails, and to heed posted warnings at local trail heads. As the coordinator and lead instructor for CORBA’s Introduction to Mountain Bike Skills Clinic, this is also the time I start seeing an increase in attendees. When asked if the class is “for beginners,” I say that even though we are going over fundamental skills, even people who have been riding for several years can benefit from the class. I’ve never met anyone over the 18 years we have been providing the class who has not gained some insight into their riding skills and technique. In my February message I noted that CORBA has created several new committees which we hope to make the organization better at addressing the myriad tasks we are faced with in dealing with mountain bike and open space advocacy. One of these new committees is our Outreach Committee. Think of it as CORBA’s marketing department. CORBA is in need of people with a background in public relations, marketing, and sales to help promote our programs and advocacy goals. In fact, you really don’t need a background in those fields, just a desire to help CORBA get the word out that that mountain biking is a viable open space activity. It only takes a few hours a month, but will go a long way to making sure we have trails to enjoy for generations to come. If you’re interested in getting involved you can contact me directly at markmtb@roadrunner.com. Thanks! Since it's inception in 1987, CORBA has relied heavily on the members of the Board of Directors to plan, organize and carry out a multitude of advocacy activities. We have been helped in many instances by our volunteers (trailwork and the Fat Tire Fest in particular), the MBU (Youth Adventures rides) and by partnering with other organizations with which we have shared interests. But we still have a lot of work to do. Many good trails are still closed to mountain biking, including every trail and dirt road in LA City parks! Our opponents have lost none of their shrillness over the years. We have made a lot of progress and count many successes, but still we would like to speed up this process. To become a more effective and efficient organization, we are moving many of the key planning activites from the entire Board of Directors to a set of committees and task forces. Some of these will be permanent but many cover short-term projects and will be disbanded when their work is complete. Youth Adventures is run jointly by CORBA and the MBU; operated by the MBU and financed by CORBA. As chair of the Communications Committee, I am looking for one or two people to help me out. We're looking for some people who are normal web surfers and perhaps have experience with social networking sites like Facebook and Twitter. If you can spare a couple of hours a month or so to help us out with one of these committees, please get in touch with us at info@corbamtb.com. Thanks! The spring trailwork day is a chance to fix up some local trails that have been damaged by the winter rains. This year we will be repairing and improving the Mountain Creek Trail in Newbury Park that we helped build last year. Details. On Saturday, January 30, CORBA volunteers had a very productive day out in the Santa Monica Mountains. 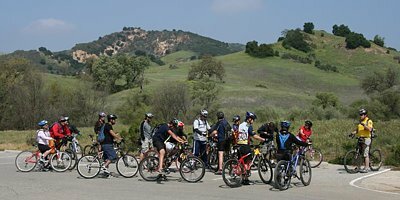 Ten riders met us at the Reseda trailhead, four of us loaded up BOB trailers full of tools, and headed for Rogers Road in Topanga State Park. Trailers and bicycles allow us to travel further down the trail in a given amount of time and get more done in the same time as the other two groups who hiked in and worked on the first mile of the trail. It was a cooperative trailwork day with the Sierra Club and Santa Monica Mountains Trails Council. These other groups stayed closer to the beginning of the trail. We rode to the Oak tree several miles in on the Backbone trail. Another five volunteers rode in from the south side and met us there. We hiked down about 3/4 of mile and went to work on this steeper and badly eroded section of trail. Most of what we did was erosion prevention, putting in new water diversions, and clearing out some older filled and blocked off ones. After several hours of work, we had built and/or restored 40 water diversions, reinforced one section of trail that was eroding away completely, as well as some brush clearance. It was a productive day. Towing a trailer full of tools on the ride out adds an extra challenge, but can also be a lot of fun. CORBA's BOB trailers have earned their keep over the years. CORBA treated the volunteers to lunch at Sharkey's afterwards, everyone feeling good about what was accomplished. When working with Sierra club and other groups on shared-use trails, it is always helpful to have a strong mountain bike contingency showing that we care for our trails as much as any other trail user group. 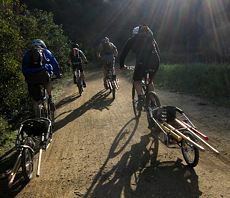 California State Parks is going to be more rigorously enforcing the regulations about riding on trails that are closed to bikes in Point Mugu State Park, commonly known as "Sycamore Canyon." New No Bicycles signs are being installed on the Ray Miller Trail (popular for night riding), Scenic and Fireline Trails. Rangers will be paying special attention to the Hidden Pond Trail. Here is a list of trails that are closed to bikes in Pt Mugu State Park and other areas. As a result of the rain we've had this winter, a boulder has slid down and blocked a switchback on the New Millennium Loop Trail in Calabasas. Most likely the rock will need to be carefully broken up into small pieces so that it doesn't cause more damage to the trail below it. Whiting Ranch Rangers and Irvine Ranch Conservancy staff has located an unauthorized mountain bike park in one of the canyons between Agua Chinon and Foothill Ranch. The site includes bench cut trails, wooden jumps, wooden bridges and a sand bag reinforced trail connecting from Mustard Trail all the way to the community. This park was created after the Santiago Fire and was cut through cactus scrub habitat that has historically hosted nesting Cactus Wrens (the park was located while doing cactus restoration work for the Wrens). Whiting Ranch Rangers are planning to remove the materials and dismantle the trails on February 20th at 8:00 a.m. They have engaged Oakley to assist and have about 12 people from Oakley. They have asked if the Irvine Ranch Conservancy would be willing to assist by generating volunteers. CORBA representatives have attended the first few meetings and have learned that the County bike plan does not include any off-road components or trails. Those are to be covered separately under the LA County Parks And Recreation Department's planning process. We understand that many mountain bikers and CORBA supporters also ride on the road, and that many of the trailheads to which we ride are on unincorporated LA County land. We recommend visiting http://lacountybikeplan.org to see if areas near you are covered. If you can't attend the meetings you can make comments online at http://lacountybikeplan.org. Especially let them know if there are trailheads to which you would ride if it were safer and more convenient, or routes to destinations such as schools, parks, etc. This first round of meetings is for information gathering purposes. At each meeting there are maps on which you can draw potential bike lane routes, bike path routes, and make notes about existing road conditions for cyclists. There will be a second round of public meetings in late spring/early summer at which people will have an opportunity to further refine and comment upon the draft plan. 6:30 p.m - 8:00 p.m.
7:00 p.m - 9:00 p.m.
For more details, view the full workshop schedule. Another 200 acres of open space was obtained in December by the City of Rancho Palos Verdes and the Palos Verdes Peninsula Land Conservancy (PVPLC). This parcel will connect the popular Portuguese Bend and Three Sisters Reserves. After years of negotations with the land owners, the result is a most happy one for open space fans. With the city's impending formation of a trails committee representing all user groups, CORBA PV has high hopes for more bicycle access. PVPLC posted its spring workday schedule at http://www.pvplc.org/calendar.shtml. Three workdays are scheduled for weeding and planting at the Three Sisters Reserve: Mar. 6, Apr. 7 and May 8. Workdays are from 9:00 a.m. to noon. Anyone interested in these dates can check pvplc.org or e-mail info@mtbpv.org for more information. If you belong to an organization that uses a Google calendar to publicize activities, let us know and we'll consider adding it to our collection. Contact us at info@corbamtb.com. The MBU Training Team recently conducted its first official training class for its new 2010 Recruits Team. On Feb. 13th, the MBU Training Team greeted over 50 new Mountain Bike Unit plus another dozen or so MVP (Mounted Volunteer Patrol) recruits. Starting in 2009, the MBU and MVP successfully combined its main training classes in an effort to gain synergies and efficiencies as much of the training material for the two organizations was very similar. Feb. 13th was focused on training specific to the National Park Service - the training included everything from the history of the NPS, proper Radio Protocol, Park rules to visitor contact skills, all of which was provided by several NPS Rangers. The next MBU Training Class is scheduled for March 13th and will focus on specific instruction provided by Rangers from the Mountain Recreation & Conservancy Authority (MRCA). The April 10th MBU Training Class will focus on California State Parks and finally, May 15th will be the final Scenario Day and Graduation for the 2010 MBU Class. For more details, visit the MBU training web page. To see the MBU in action, view our gallery of MBU photos. Saturday March 6th is the next skills clinic. We have set up an account with Twitter to help keep people informed of the latest developments in our trail advocacy, recreational rides and trailwork days. Follow us on Twitter at twitter.com/CORBAmtb.